The comic was performing at Brighton’s Dome when he brought the night to a premature close. Comedian Kevin Bridges is expected to return to the stage on Thursday night after apologising to fans for cutting short a gig. The Scottish comic, 32, was performing at Brighton's Dome on Wednesday night when illness and hecklers brought the night to a premature close. He later told fans that the audience would get refunds, saying any remaining money would go to good causes. A spokeswoman for the comic has now said the remaining shows this week on Bridges' UK tour were expected to go ahead. Bridges had said in a statement on Twitter: "My apologies to everyone who came to see me tonight at the Dome. "I have been ill for a few days but I didn't want to cancel the gigs as I felt the adrenalin of performing could carry me through, as it usually does and did tonight for the majority of the show. "People shouting nonsense throughout the gig is something I'm well used to after 15 years in stand up but tonight I hit a wall physically and maybe mentally and I'm truly sorry to everyone who I let down by finishing early." The comic, who has appeared on TV panel shows such as Would I Lie To You? and Have I Got News For You, signed off the message "apologies and onwards, Kevin". Fans took to Twitter to show support for the Glasgwegian with one writing: "What a guy!!! 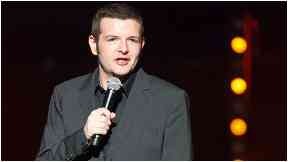 Kudos to you for going ahead with the show @kevinbridges86 and even more so for your amazing generosity." Another said: "What an unbelievable gesture Kev. Salt of the earth. Weeks after seeing you in Glasgow and wee snippets keep creeping back into my mind now an then an make me chuckle. All the best hope your in the mend." One added: "Apologies on behalf of Brighton for the morons who spoiled last night's show. Get well soon. Hope to see you again - we were really enjoying ourselves up to then."